Click here for list with dates, locations and complete contact information. Campus Kids Days: What are they? 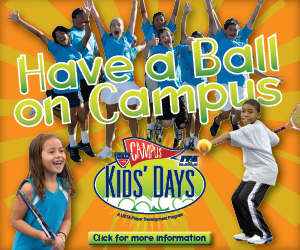 Campus Kids Days are designed to expose current and aspiring junior players (and their parents and coaches) to college tennis. College coaches will select a team match that members of the local community are encouraged to attend. Food and refreshments will be provided for all attending. Fans will be encouraged to participate in a variety of promotional activities such as raffles, contests, racquet stenciling, autograph signings, clinics, etc. Provide staff administrative support to assist with promotional materials as well as handle questions and paperwork. Coordinate dates with USTA Section Staff and volunteer sectional collegiate committee. Connect college coaches with USTA Section Staff and sectional collegiate committee. Promote events on USTA Sectional websites and connect to college team sites and the ITA website. Promote events on the USTA College Tennis website. Select varsity team matches for consideration for a Campus Kids Day and register your event online. Clear event and promotions with compliance office. Work with USTA National and Sectional staff and sectional collegiate committee on event promotion. Forward promotional flyer, final headcount, and receipts to USTA National office upon completion. PLAYER DEVELOPMENT Getting more junior players (the future college stars) on college campuses at a young age—exposing them to the fun and excitement of college tennis. INCREASED FAN BASE: Filling stadiums and bleachers with juniors, their parents, and coaches. COMMUNITY OUTREACH & ADVOCACY: Helping build stronger ties between college programs (coach and players), their USTA section, and the local tennis community. Coaches should work with their compliance office to gain clearance for their event and subsequent programming. The examples listed are just that, examples, and should be examined and approved by each institutions compliance office.